How do you know to choose a trekking program in Chiang Mai with different locations but be similar activities ? There are currently three main trekking routes : Chiang Mai – Jom Thong route into the mountainous northern areas, especially home of hill tribes, Chiang Mai offers unique opportunities for the adventures. Lush hills and virgin forests are scenic backdrops that will make your trekking by foot or Trek on elephant back truly memorable. The most popular trails are in Doi Inthanon National Park where over 300 bird species and a wide variety of orchids and other flowers can be seen. 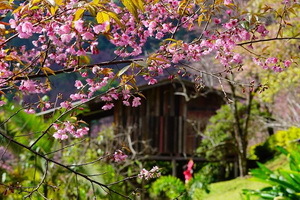 ; the Chiang Mai – Mae Taeng Driving from Chiangmai city to Maetang fantastic nature area about 1 hour. On trek program would walk through the forest, touch the nature is pure on top the hill , and learn way of life, culture tradition of a hill tribes, have a dinner and stay overnight at hill tribe village. The trip usually includes a raft trip down the Mae Taeng River, Elephant Riding, White water rafting, Bamboo rafting, Hill Tribe Village, orchid farm ; and the Chiang Mai – Mae Hong Song is the great experience and, many of tourist visiting the north enquiries. Driving from Chiangmai city to Mae Hong Son around 6 hours, you’ll stun with scenery along the way. About hill tribe trekking you will see the real different life style of hill tribe, house, beautiful, scenery, landscape, green jungle, waterfall, cave and etc. stay overnight and cooking with the tribe family, hiking through the green jungle, have an experience with elephant riding and bamboo rafting for unforgettable for the lifetime. Get the most out of your holiday with an unforgettable Adventure Trekking in Chiang Mai, Thailand. Doi Inthanon is Thailand’s highest mountain, 2,599 metres above sea level. Doi Inthanon Peak has a cool climate all year round. The Air Force Radar Station and King Inthawichayanon’s stupa located on the mountaintop. King Inthawichayanon, the last king of Chiang Mai, was concerned about the importance of forests and wanted to preserve the forests for future generations. He was so familia with Doi Inthanon that he asked that part of his ashes be kept here. The Wachirathan Waterfall is the second major waterfall on the way up Doi Inthanon. This one is an impressive and powerful waterfall falling (and I’m guessing here) some 50-60m though we’ve been told the height is more like 80m. The falls also is wide, but the segments to the right of the main tier tend to be stringier and lighter flowing. When we were there, the falls had enough volume to produce mist, which in turn produced a rainbow. It’s obviously a year-round waterfall, but the flow becomes less intense as the dry season progresses. In the wet season, the flow becomes wide enough and misty enough to cover the wall over which it drops and thus can make photography rather difficult without drenching yourself and your camera. There are plenty of walkways to experience the waterfall. However, the lowest walkway tends to be muddy and slippery from the spray so caution is advised for this section. Nam Tok MaeYa waterfall is with 280 meters the highest waterfall of the Doi Inthanon national park near Chiang Mai in Thailand. This place is one of my favorites at the national park in Thailand’s Chiang Mai province. Here you can relax and listen to the sound of the huge Mae Ya waterfall. 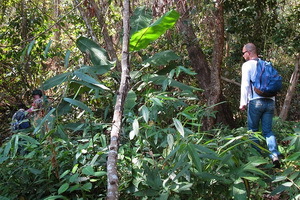 The distance from the parking place is about 600 meter through the tight jungle here in north Thailand. The small hiking path is easy to take. On the foot of the MaeYa is a small place to rest and watch the might of the nature. We were visiting the fall in September 2009, and we were the onliest tourists on this peaceful place near Chiangmai. The best way to come here is by motorbike or car because than you can take your time and stay a while on the Nam Tok Maeya. If you come with a tour you have mostly many people around you and less time. We really can recommend to come here if you traveling in north Thailand and want to see the beautiful nature here at Doi Inthanon in this part of Asia. The Mae Klang Waterfall (Namtok Mae Klang) is the first waterfall you might encounter on the road going up to the top of Doi Inthanon, Thailand’s highest peak. This often-photographed waterfall cascades in a main maybe 25-30m or so tier before casscading further downstream in several drops. The falls is actually on a spur road branching left from the road up to Doi Inthanon as you leave from Chom Thong (66km southwest of Chiang Mai). It’s a pretty popular picnic spot, but like I said earlier, the falls here is certainly no slouch. Located in the area. Mae Wang National Park. A one-storey high waterfall about 20 meters, 10 meters wide with water throughout the year as the most beautiful place of the river water. Forest surrounding the waterfalls dipterocarp forest, mixed deciduous, dry dipterocarp forest and mixed pine rainforest. Along the path to the point of natural water basins under waterfall Suitable for activities such as swimming, swimming. 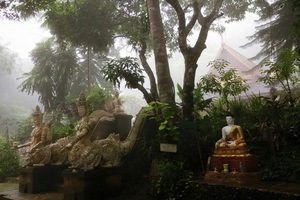 Mae Sa Waterfall is another image of Chiang Mai, although it is somewhat less famous than some other sites. The waterfall has 8 tiers and set against a backdrop of huge trees it is very impressive. The climate around the waterfall is cool throughout the year and it is a very popular meeting place for locals. For foreigners, the trip is often combined with a visit to the Mae Sa Elephant Training Centre. How to get there: Mae Sa Waterfall is about 25 kilometers north of Chiang Mai on the Mae Rim-Samoeng Road. A number Songtaews are available from the city to the waterfall. Hilltribe peoples migrated over 100 years ago from the southern part of China into Laos, Myanmar (Burma), Vietnam and Thailand. They have preserved their way of life with little change for over thousand years. Comprising seven major tribes, KAREN, HMONG (MEO), YAO, LISU, LAHU, LAWA and AKHA, each has its own distinct culture, religion, language, art and colourful style of dress, these people make their homes in the highlands. The main profession of all these tribes is farming. All the tribes are hospitable and welcome visitors to their villages, providing them with the opportunity to see and experience their way of life. Doi Suthep-Pui National Park is the nearest national park in Chiang Mai right at the west edge of the old city. The park is home to largest Hmong hilltribe village in Northern Thailand, more known for the Doi Suthep Temple at the top of the mountain, easily seen from the city. The park has many paths crossing the wonderful rain forests of the park on all directions. A day trip to the park includes visiting Doi Suthep Temple and hiking along one of best trails in Chiang Mai area, with good views over surrounding areas and through some Hmong villages. There will be less driving and more hiking for sure. Being one of the remotest provincial towns in Thailand trekking from Mae Hong Song trekking in the hills in this province can be very rewarding. The trekking industry is not so well developed here but local guides and agents can arrange overnight trips into the hills. There are plenty of hilltribe villages in the hills around Pai. and with the popularity of Pai as a destination itself you will find plenty of agents and guides offering their services to take you on a hill tribe trek. Ask t your guest house or at an agent in town. Trekking what to bring ?